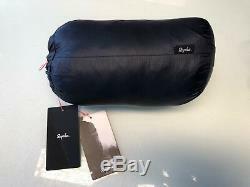 RAPHA Explore Down Sleeping Bag. Size: small/medium (5 10 and under). A lightweight, packable sleeping bag designed to combine with the Explore Down Jacket. The item "RAPHA Explore Down Sleeping Bag Dark Navy, Small-medium NEW" is in sale since Wednesday, March 20, 2019. This item is in the category "Sporting Goods\Cycling\Cycling Clothing\Jerseys". The seller is "colin1230_2" and is located in LONDON. This item can be shipped worldwide.